Cryptozoic Entertainment, leading creator of board games, trading cards, and collectibles, and Warner Bros. Consumer Products, on behalf of DC Entertainment, today announced the release of DC Deck-Building Game Crossover Pack 6: Birds of Prey. The expansion for the popular DC Deck-Building Game series allows players to play as the popular all-female DC Super Hero team the Birds of Prey. The team utilizes a brand-new “Rotated Cards” mechanic. Each player chooses a Birds of Prey Super Hero to play as—Oracle, Black Canary, Huntress, Catwoman, Katana, or Batwoman—and then they shuffle in the pack’s 23 new main deck cards into any DC Deck-Building Game base set, instantly adding all-new Equipment, Villain, Hero, Super Power, and Location cards. The pack even comes with eight Super-Villains for the Birds of Prey to battle. With the “Rotated Cards” mechanic, certain card effects allow players to rotate their cards. There are many bonuses simply for controlling rotated cards, making Ongoing cards especially beneficial since they maintain their rotated status. Moreover, some Ongoing cards generate a large bonus when they rotate for a fourth time, returning upright. DC Deck-Building Game Crossover Pack 6: Birds of Prey is available at retailers nationwide now for a suggested retail price of $13. 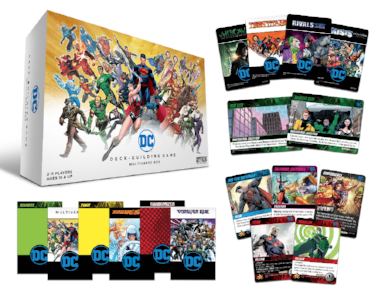 It requires a copy of the original DC Deck-Building Game or one of its standalone expansions—Heroes Unite, Forever Evil, or Teen Titans—to play. Are you a table top gamer? Let us know in the comment section below. Also, Don’t forget to like, share and subscribe to all things Constant Collectible to keep up to date with all the news and reviews from a world of GEEK CULTURE.